Lauran Stimac - Glassman, Wyatt, Tuttle, and Cox, P. C.
Lauran Glassman Stimac joined the firm in September 2012 as a trial attorney, having practiced in Richmond, Virginia for five years prior thereto. She joins her father, Senior Shareholder Richard Glassman, in focusing her practice on legal malpractice and medical malpractice. Lauran Stimac has participated in a wide variety of medical litigation matters involving patient falls, medication errors, cardiac care, emergency medicine, laparoscopic surgery, anesthesia care, gynecological surgery, and birth injuries. She has also defended attorneys in legal malpractice matters and Board of Professional Responsibility matters involving assorted underlying cases. Ms. Stimac has lectured and written for legal and healthcare audiences on the issues of developments in Virginia law, communication among healthcare providers, advance medical decision making, Medicare settlement reporting, emergency department care issues, and other topics. She has also co-presented at seminars for attorneys in Tennessee with her father and senior shareholder, Richard Glassman, regarding practice management, avoiding malpractice, legal ethics, and professionalism. 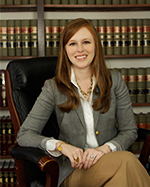 In addition to her law practice, Lauran Stimac is an active member of the Junior League of Memphis. She serves as a board member of the Memphis Area Legal Services Board of Directors, the Memphis and Shelby County Sports Authority Board, and the Alumnae Board of St. Mary’s Episcopal School. She also serves as a volunteer and a supporter of the Memphis Area Legal Services Campaign for Equal Justice, the Memphis Child Advocacy Center, the Exchange Club Family Center, and the Kappa Kappa Gamma Alumnae Association of Memphis’ Literacy Is Key initiative.